While battling the summer rain, we decided to settle for Thai dinner which was located close to the Capital FM Arena Nottingham, so that we could figure our way to the venue in time for the opening of Westlife's concert. Amazing Thai has 2 branches located within Nottingham itself, so we thought it should be quite a decent restaurant, anyhow, let's get on the food! Upon arrival and choosing our table, we were served with a bowl of prawn crackers and sweet-chilli sauce. The hospitality was definitely good and made us felt very welcomed. Like most Thai restaurants in the UK, it was ran by Thais, though unfortunately we were unable to return the greetings in Thai. Deep fried Thai style fish cakes served with relish, mixed vegetables. 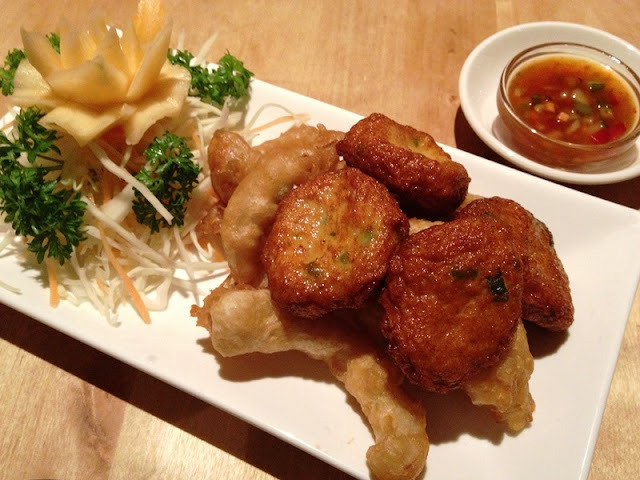 It had been a while since we last tasted authentic Thai-style fish cakes, so this starter was a must-have. Served with a bed of fried onion rings too, it was presented in a rather unique way. The sweet-chilli sauce was specially blended and tasted rich. It was unlike those bland sweet-chilli sauces available off the shelves at supermarkets. The fish cakes were very fragrant, owing to the herbs and spices used. The onion rings were big slices of sliced onions and fried covered in batter. The surimi-filling tasted fresh and had a bouncy texture to it. Coupled with the crisp fried surface, it was definitely a treat. 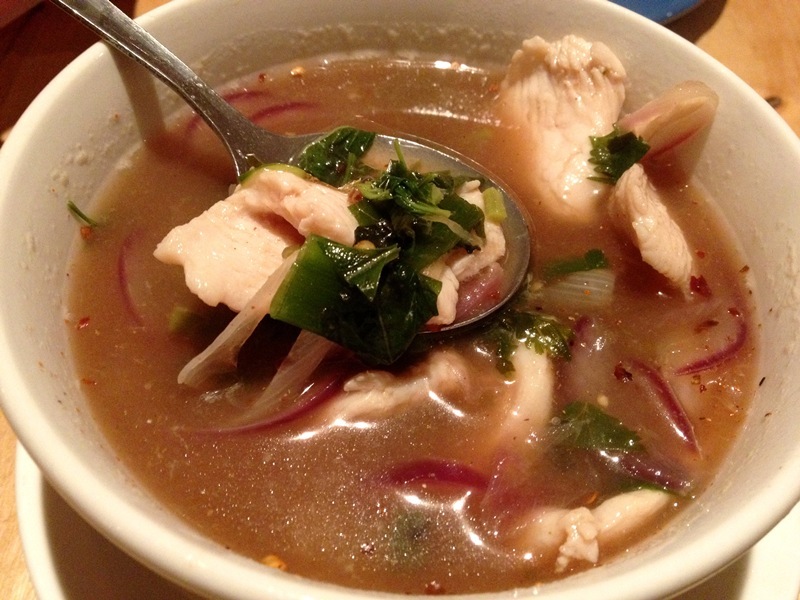 Spicy soup, North-Eastern style with chilli and lime juice. This was one of the highlights of our dinner! Despite looking plainly simple, the soup upon first tasting delivered a 'kick-back' effect. Always in the appetite for spicy food, it suited us real fine. The best part about it was the chicken slices which tasted very tender and smooth. In fact, this was the case for all their chicken dishes (as tried later with the green curry). It was spicy with a strong 'soury' tinge, but not enough to overwhelm. Personally, I would have preferred it better if it was stronger, but it was probably to cater to the tastes of the locals. 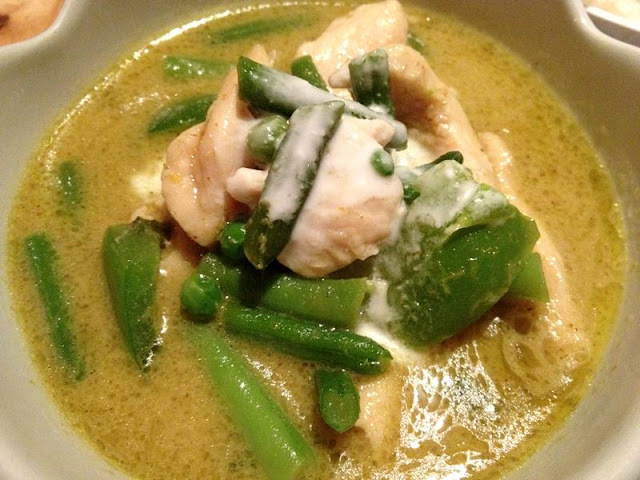 Green curry, long beans, chillis and sweet basil leaves in coconut milk. Labelled as one of their recommended dishes, we were left slightly disappointed with the green curry. It had a rich coconut taste to the curry, but it was prepared immoderately sweet (well to our tastebuds anyway). The menu listed aubergines as one of the key ingredients, but this was a 'green green-curry' with plenty of long beans and green peas to make up for the aubergines. As suggested above, the chicken slices were very tender and smooth. Despite chicken breast portions being used for the curry, it did not taste the slightest bit stiff, and that definitely won us over. 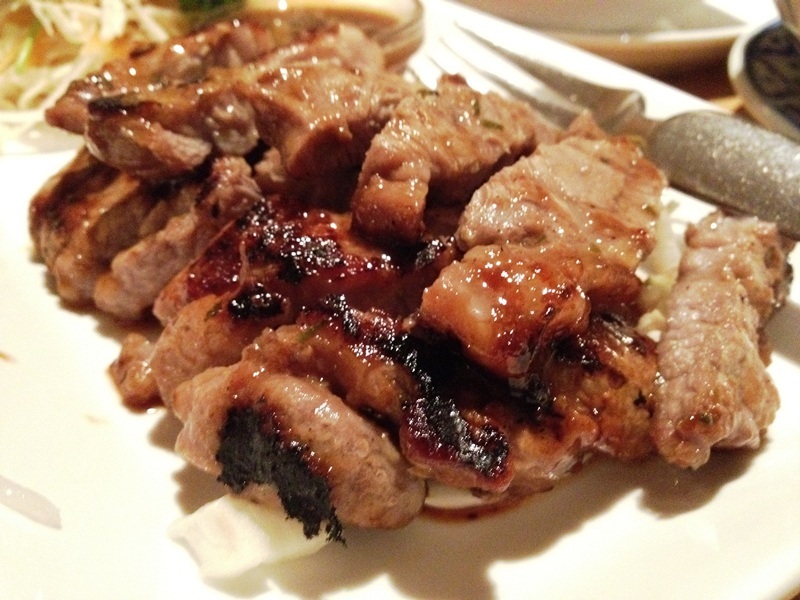 North-eastern style grilled pork with Thai herbs. The sauce that accompanied this grilled dish was good and tasted unique. However, certain portions of the grilled meat tasted too stiff for our liking. This could probably be owed to the comparison made with the chicken dishes, so we had expected the pork dish to taste about the same or better. It was a simple grilled dish, nothing to rave about. It had been a long while since we last tasted coconut and sticky rice (since the relatively nicer Thai restaurant in Leicester closed down). Anyhow, this version of coconut rice was too sweet for our liking. The fragrance was overwhelming though when it was first brought to our table, but it made us felt full rather quickly. I would personally give this a miss if I were to revisit. The rice was not exactly very 'sticky'. Instead, it tasted rather dry and hard. 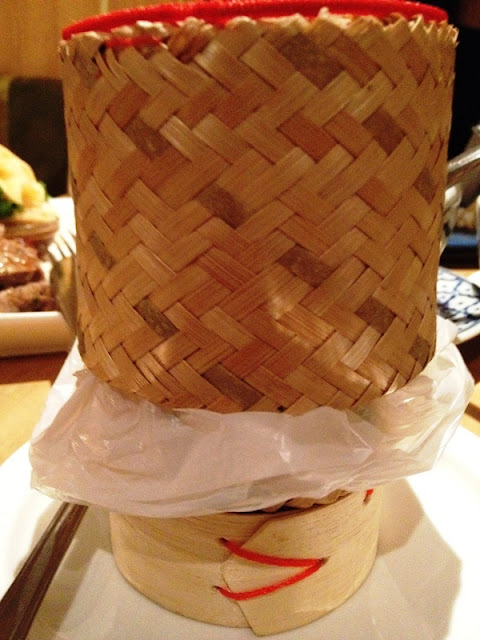 Wrapped with the white plastic visible above, it was steamed in this bamboo canister. It scored points for presentation, but it was rather tasteless regrettably. 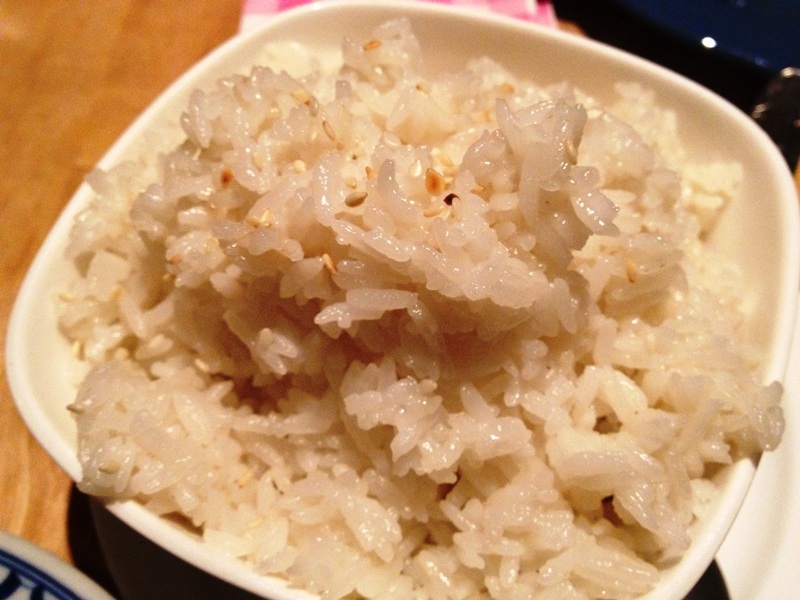 We thought that normal plain rice might have done the job better. Also, the portion of rice for the price was not exactly worth it in my humble opinion. The ambiance of the restaurant was good. With dimmed lights and nice sofa seats (for our table), it was quite a romantic dinner date for us (well minus the rain). The outlook of the restaurant was nowhere close to impressive (we had to walk down a long flight of steps), but the waitress who served our table was polite and friendly. The standard of the food in general was above average and would definitely be worth another visit shall we drop by Nottingham again!